Behind a potent scoring offense, the 1987-88 Los Angeles Lakers finished the regular season with a record of 62-20. Head coach Pat Riley had more than enough options, with Magic Johnson (19.6 points per game), James Worthy (19.7 PPG) and Kareem Abdul-Jabbar (14.6 PPG) all capable of carrying the team. Even with those Hall of Famers on the roster, it was Byron Scott (21.7 PPG) who led the team in scoring. After sweeping the San Antonio Spurs in the first round of the playoffs, the remainder of the postseason would test the fortitude of the defending-champion Lakers. Los Angeles was pushed to the max in consecutive seven-game series victories over the Utah Jazz and Dallas Mavericks to reach the NBA Finals. There, the Lakers would once again survive in seven games - this time over the Detroit Pistons - to repeat as NBA champions. 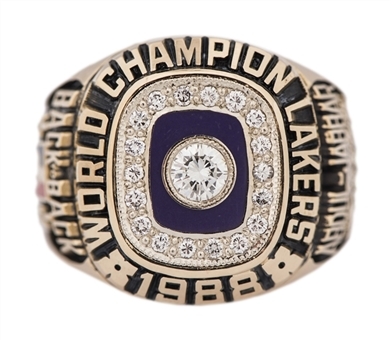 Offered here is the Balfour 14K gold 1988 Los Angeles Lakers NBA championship ring presented to Hall of Famer and NBA all-time leading scorer Kareem Abdul-Jabbar. This ring features a larger round diamond set on a purple face, with smaller diamonds going around it. “WORLD CHAMPION LAKERS 1988” reads in relief work. Please note that it appears that the two individual small diamonds surrounding the “1988” are missing. 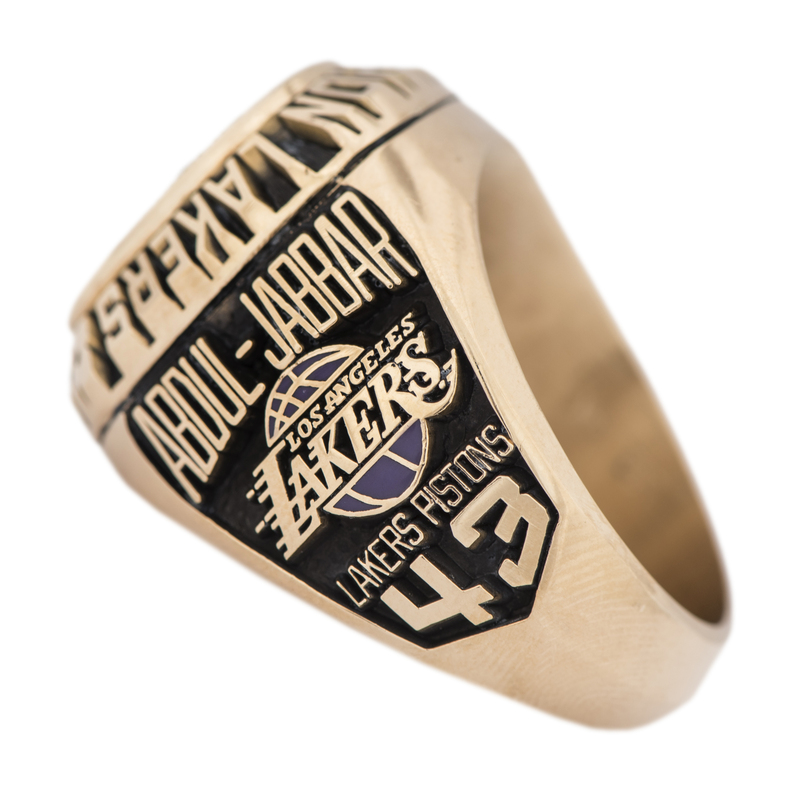 An enamel-filled Lakers team logo centers one side of the ring, with “ABDUL-JABBAR” above it and “LAKERS 4 PISTONS 3” below. 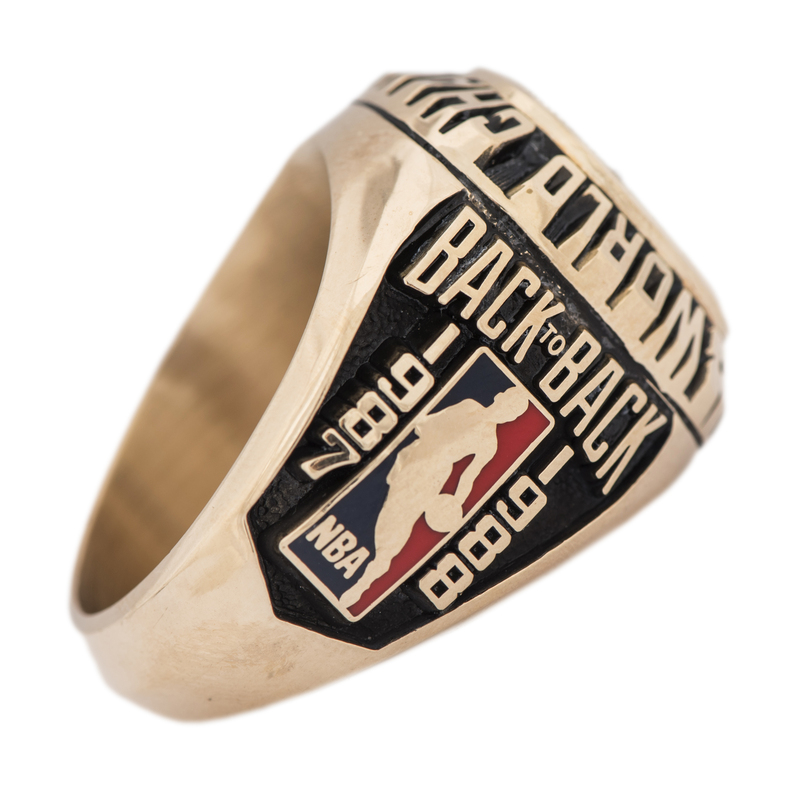 “BACK TO BACK” appears on the opposite side, above an NBA league logo finished with enamel. “1987” is shown to the left of the NBA logo, with the year “1988” to the right. 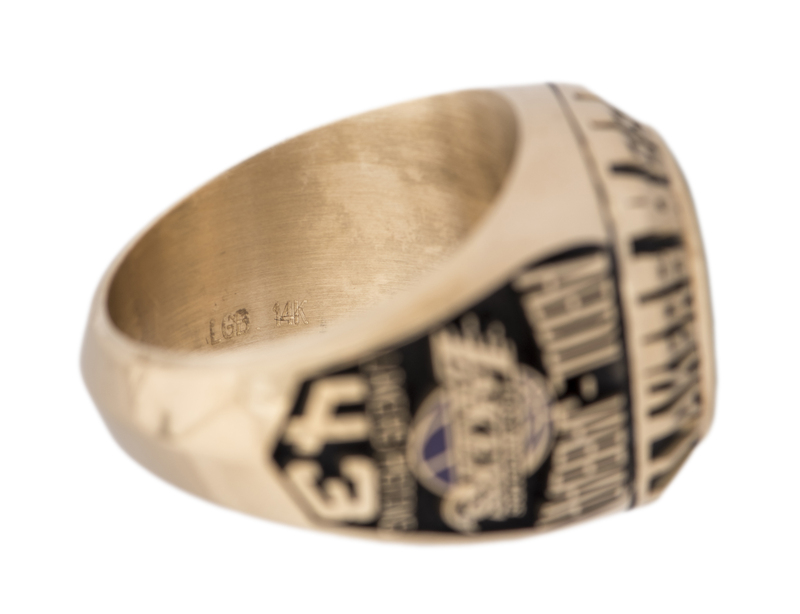 Inside the band is marked “LGB 14K”. 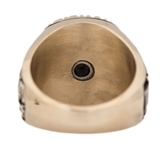 This ring is an approximate size 12 and weighs approximately 39.0 grams. 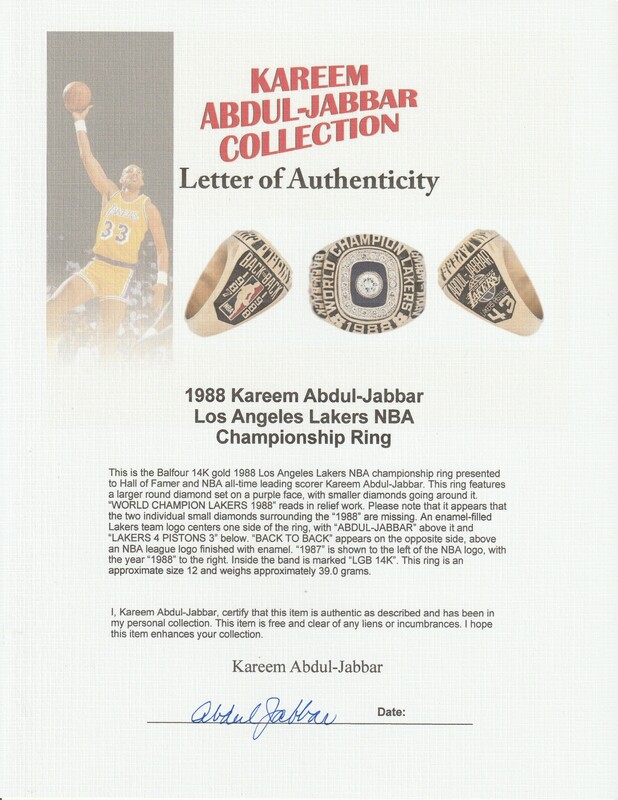 This item comes with a signed LOA from Kareem Abdul-Jabbar.